Would your group like Day with Ann Knitting ? Ann can either demonstrate to your group her techniques, where she will sit at a machine and take you through all the techniques required to knit the chosen design. Working from yarn, to knitting, to final pressing and finishing. This type of course takes one day normally 10am to 4pm stopping for an hour lunch. Brother, Silver Reed or Passap OR You can knit on your own machine any of Ann's' designs and have her expert tuition on hand to guide you through the garment of your choice. This type of course requires a minimum of 2 days. 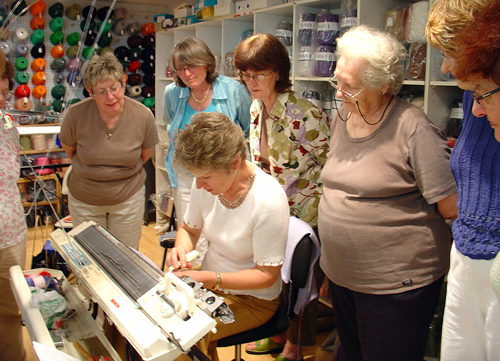 Groups are normally no larger than 12 for a Hands-on Workshop, and a maximum of 20 for a class where Ann demonstrates. Distance no problem.